Place oats, milk, yoghurt, chia, sultanas and half the coconut in a small jar or container; seal and refrigerate to soak overnight. 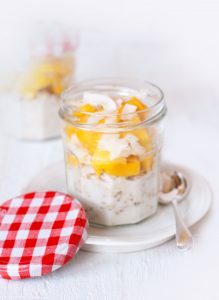 Top porridge with mango and remaining coconut, and serve. Any fresh or frozen fruit can replace the mango.